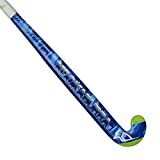 I love the Kookaburra Vortex i-Bow and I’m very pleased to review it, the 2012 model was my first purchase of a new hockey stick since coming back in to hockey and I am so pleased with it, I still play with it now. To provide the best review of the Kookaburra Vortex I should probably remove emotion and concentrate on what’s great about the stick. However if you are like me you fall in love with your sticks, especially those that help you make advancement in your game. Why would the Kookaburra Vortex be so memorable to me? Well I managed to pick the stick up as a complete bargain on Amazon, just £79 at the time and even now you might need to pay over £100 for the 2012 model. Shop hard people. Coming back to hockey from the days of wooden sticks I tried out a number of my new teammates sticks, bought a couple of second hand sticks and the one thing I was sure on after my evaluations was I couldn’t quite get to grips with the big and low bow models of hockey sticks. After strenuous research I narrowed down my choice to the Kookaburra i-Bow range. I wasn’t disappointed because the stick has a reasonable curve at 21mm and what I like about it is that its smooth, the stick from just below the handle down bends nicely to the head, there’s no sudden bow. Since then I have played or trialled a number of sticks with more definite bows and although I see how they can benefit I keep coming back to the more consistant bowing sticks like that of the i-Bow range from Kookaburra. The only thing I’ve played with so far that compares is the Gryphon Tour Classic Curve, but that’s a different animal. For a mid-range stick the Kookaburra Vortex has a really nice weighting of 85% carbon in it’s material composition. Originally I believed this would add durability, which it does, but now I understand it adds power in your harder hits. This really does make it, in my opinion a great value hockey stick for the price. Because the Vortex isn’t in the “Team” series of Kookaburra sticks the carbon is shaped in to a dual core configuration rather than a tri-core. The additional core is designed to add additional stiffness to the shaft for heavy hitters. To be honest all this talk of hard hits is rarely relevant to the average club player who concentrates on hitting the ball sweet rather than hard, so its perfectly adequate, especially with a high carbon content like that of the Vortex. Something else I love about the Vortex is Kookaburra KCF technology, which is a gripping texture on the head. I mean it’s not quite like sticky back plastic but it certainly helps me receive the ball more steadily, particularly on the reverse side I find. Talking of the reverse side, this type of hit for passing and particularly for shooting were (and still are) the area of my game that needs most improvement. Kookaburra has the reinforced edge that gives a little forgiveness when I scuff them. It is worth noting that the Vortex does not have the EVA foam reinforcement in the later models of the ‘Team’ series Kookaburra sticks. However though it seem feasible a foam based reinforcement could add something, no one can explain what EVA stands for and having had a little knock with when writing the review for the Kookaburra Team Phoenix I hardly noticed the different. Overall I find the Kookaburra Vortex i-Bow a very playable stick, it throws the ball far enough for me, is lovely to dribble with, hits hard enough (I have the medium weight stick) and its standout feature for me is the control it gives when receiving the ball. Design wise I think the white handle on the newer models is nicer, though that’s probably personal preference. Actually while I write about the handle, mine has been through a couple of seasons now and I’ve not used any tape on it! Maybe I’m not playing hard enough. The colors are really nice, the very dark grey contrasts well with the electronic Blue and the whole things has a grown-up cool look to it. As I said at the beginning, emotion has played a small part on my review of the Kookaburra Vortex i-Bow but I can tell you it’s a really great stick. Will certainly suit a player looking for a good quality hockey stick that is versatile for most functions on the field. Especially if they don’t want to have one of these crazy new fangled bends in the shaft, not yet anyway! Enjoy it, and try to find it under £100, amazon is your best bet.